Big thanks the the MoyaRuiz family for hooking it up with samples to both Jeremy and I. You can actually check out Jeremy’s full review here. Well, it’s a nunchuck. There you have it. Very Gimmicky, yes, but I actually applaud MoyaRuiz for thinking outside the box on this one. Not to mention it fits the Cigar Dojo theme to a tee. Looking at it from a cigar standpoint, its actually a beautiful thing. The wrapper is absolutely beautiful. 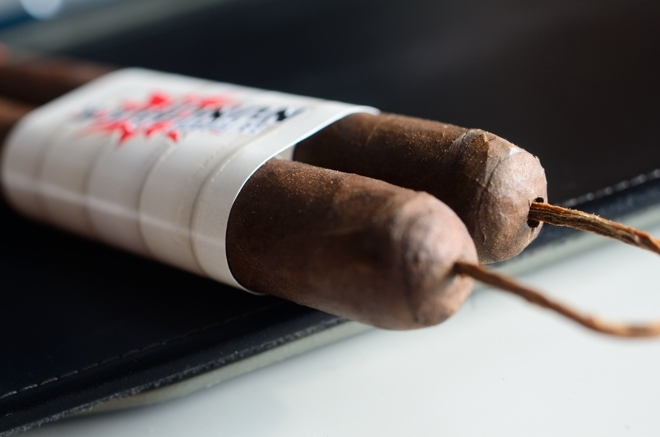 The color consistently dark brown with some slightly darker webbing spanning the body of the cigar. The wrapper carries some mild tooth and a impressively thick layer of oil coating the entire cigar. There are a few slight veins but nothing too worrisome. The Nunchuck is very thick, dense, and heavy and the wrapper is as hard as a rock. The beefy body leads up to a round, double cap with a tobacco-made string that runs from the center of the cap of one cigar to it’s pair. 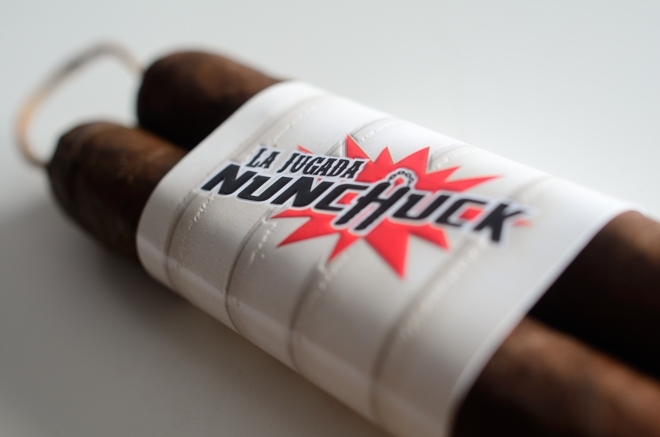 The La Jugada Nunchuck is polished off with a massive white band that spans box cigars with the words “La Jugada Nunchuck” on the front of it. The burn line started out a bit wild as I lit up the La Jugada Nunchuck, but cleaned up about an inch in and remained solid the entire length of the cigar. The burn line was razor thin and left behind a very tightly compacted trail of medium and dark gray ash which held on for and well over an inch before giving way. The draw on the Nunchuck is incredible. Each tiny, little puff kicks out a massive cloud of thick white smoke. This cigar lets loose a ton of stationary smoke as well as it rests in my ashtray. The La Jugada Nunchuck starts out with a nice little black pepper bang which actually carried itself through the first half of the experience. Underneath there was some deep cocoa, coffee, cedar, and a bit of leather. Halfway through I started pulling out some subtle floral flavors as well some strong sweetness. The cigar finished very creamy with a ton of cedar and sweetness. There was no harshness at all and I was very impressed with how bold the experience delivered by the Nunchuck was and how balanced the strength was. I’ve been impressed with all the cigars under the La Jugada brand, and the Nunchuck just added to the list. 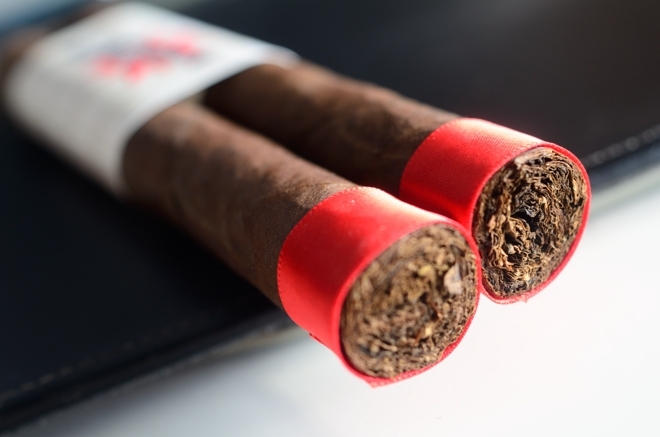 The cigar is decently complex, bold, and finished smooth and creamy without the strength overpowering the experience which is exactly what I look for in a cigar. Again, it’s a bit of a gimmick, and the price point is up there, but this was a fun cigar, and a damn good one. Nice review, Tony! I am glad you enjoyed the cigar. I thought it was one heck of a good smoke as well.